There are so many wonderful things about parenthood and raising a child that they are hard to list. The magic in your child’s eyes when they are truly happy, the moment when the light bulb goes off and they learn something new; those moments are sometimes like the one perfect golf shot in a horrible round. You faced your fair share of frustration but those few key moments make up for them all and continue to re-enforce your love of the game. It may sound silly but when that lone nugget remains and your kid has moved onto the playground or decided to finally attempt in public their Houdini high chair escape they have been perfecting at home, you grab that little reward, dunk it in polynesian sauce, and relish in parenthood sweetness. But don’t take too long chewing a victory lap, your kid is about to bust their head open when her feet get tangled in the high chair straps. get in the game buddy, the party is over. The Bonus Nugget is totally sweet. The first time I ever wandered into a warehouse membership store (Costco, BJ’s, Sams, etc.) 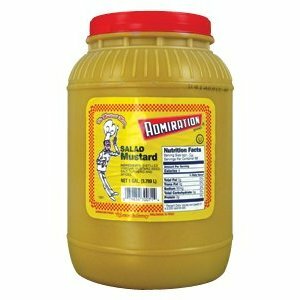 I wasn’t married, didn’t have any kids, and still left with a three gallon tub of mustard. Somewhere along the line I got caught up in the hype and the thought of being the mustard king for only six dollars was a bit intoxicating. Two years later I threw away 2.5 gallons of old crusty mustard that had not been refrigerated after opening. Who has room for a keg of mustard in their refrigerator? Now that I am a family guy we take advantage of the local discount club and tend to have a better strategy when it comes to running an inventory of household necessities. Some products like paper towels and diapers are stockpiled into a seemingly endless supply and some inventory like milk run in a” just in time” inventory management system. There are benefits to both and they each have their drawbacks as well. The only thing worse than being out of milk is having milk within 2 days of the expiration date (on either side), and where in your house is there enough room to store a pickup truck load full of paper products? The worst part of the buying in bulk strategy is that it lulls you into a false sense of security with your seemingly infinite supply. You start letting the baby empty an entire box of tissue because it is cute and when a drink is spilled you just put the entire roll of paper towels on top of it and step down until the quicker picker upper finishes its magic. My wife isn’t a huge fan of this type of behavior but when our basement looks like a nuclear fall-out shelter full of supplies some of that stuff needs to be used. It seems like it will last forever but guess what? It doesn’t. And though it may take months, when it is gone it always catches you off guard. Walking into your bathroom and seeing an empty roll holder and a stack of yellow Wendy’s napkins on the back of the toilet is totally weak. This entry was posted on Wednesday, April 18th, 2012 at 12:21 pm	and tagged with family, food, humor, parenthood, Random, shopping and posted in Uncategorized. You can follow any responses to this entry through the RSS 2.0 feed. In my experience, the fastest way to get kids to suddenly decide that they HATE a pricey snack or treat is to buy a case of it at Costco or BJs. That is so spot on, good call! You’re so right. I remember just as I was relishing that little nugget in polynesian sauce, it was whipped out of my mouth and I had to live on the memory of it until the next one. But they never failed to come, again and again. Today I look at my boys, and man, am I proud. 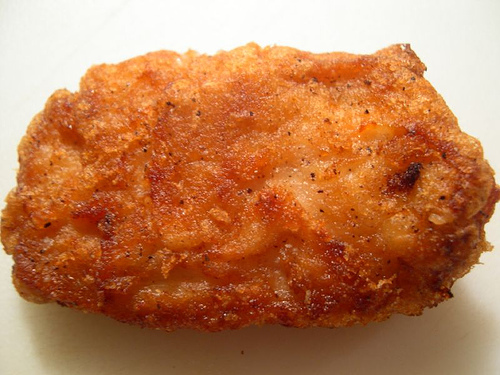 That’s the permanent nugget. This warms my junk food junkie heart. My move is to order the appetizer sampler knowing my kids don’t like the onion rings. I get them all to myself. I lovingly pick one up, I carefully dip it in the creamy chipotle sauce, and the savory symphony begins. Thanks for making me smile. I love the bonus nugget too!! We waste a whole sauce just for mama’s lone nugget because my kids don’t even use sauces. I also love the bonus fry in the onion rings, or never fails, there is always one more ring at the bottom of the bag under the holder. LOL! I won’t even go to the mustard because the idea of that much mustard gags me, and I am a recovered mustard-olic who used to put it on everything from pretzels to chocolate chip cookies! Love the blog! You should have kept the mustard!!! Thanks, I did keep it for a year or so but then got a little worried about getting past all of the mustard crust coating the top of the jug. gross. Costco just draws me in, makes me think it’s okay to buy things I would otherwise pass up. Those cute dog toys? Why not? Fifty pounds of pasta – what a deal! Ooooo, I just love those jeans! Yep. Then I spend the next six months paying off the bill. But that pasta will last a long time, and the dogs love the toys. . . .
Nice post. I enjoyed the story. Thanks for sharing. Very sweet, cool post! You rule! Can totally relate to the bonus nugget – only in my case my reward is the bonus fries in the bottom of the bag – don’t even think about it – they are MINE! And as for Sam’s and Costco, I’ve been in there a time or two, but those places are for people with huge families and even bigger storage closets. Strikes me recently that those 3 beings I’ve created who have grown into adult sized teens might plop me right there in the huge family category. Sure, we’ll use 50 rolls of TP in a month, but just where am I supposed to keep it? Haha – and not even your own napkins (that you bought in bulk). Lol first off Ill start by saying I am not a parent so the lone nugget story is a bit lost on me. However, I will say that the three gallons of mustard is not. I am the girl who looks for bargains so bulk is my friend even though its not my wallets friend. Sometimes I buy stuff I really dont need. Luckily for me BJS is far outta my way and there is no Cotsco near me so my bulk shopping ability is limited. That is the thing about bulk, great deal but where do you store it?